← Transitions: Am I ready for my kid to ride? This is our second post in our transitions series. The other day we talked about parents preparing to let kids ride their own bikes in the road. If you haven’t read the comments from that post, do it. You all have so much great insight to share. Based on your comments, it looks like we’re all in agreement: When we talk about riding in the road, we’re not talking about a couple of kids racing each other around the block to blow off steam (not that there’s anything wrong with that). No, we’re talking about real mobility, car-replacement stuff: riding to the library, the local lake or pool. Grocery shopping at the store with the good cheese aisle and more. It’s fairly easy for younger kids to ride to a neighborhood play-date with parents. The next step is incorporating normally car-centric errands into longer rides with traffic. For most kids, or maybe more accurately, their parents, it’s that jump up to the next level that’s the big deal. A key aspect to a successful transition is obvious: Where you live heavily determines how easy it is for you, and your children, to ride. A bike friendly, geographically approachable neighborhood goes a long way toward making riding a fun, reasonable choice for both parents and kids. If your community has some calm side streets and drivers who wait until it’s safe to pass a biker and your kid is a good rider, they should be able to take short rides in the road with parents as young as 6 or 7 (maybe even younger, depending on the child) . Our first-born daughter started riding in the road when she was 7 (our son was 5). Had our son been the first child, we probably would have waited until he was at least a year (maybe 2) older. But when the whole family is getting around by their own power, the little one has extra motivation to step it up. Or the parents just expect more of him. Does your community have bike friendly infrastructure? Bike lanes, sharrows or completely separated bike paths? If your community is not bike friendly (maybe you have speeding traffic, or the roads have no shoulders or drivers yell at you to get on the sidewalk, you may have to wait a lot longer to let your kids loose on a bike. This is definitely more challenging and may take some creative solutions. Again, like your readiness as a parent to handle bike riding kids, communities are all different and you are the only one who can decide if it’s safe and what you’re comfortable with. Along with infrastructure, another aspect of a bike friendly community is the people. Are there other bike riding families around? Or are you that lone freak family that gets around on bikes? This is huge. Seeing other bike riding families gives us validation and makes our choice seem normal. If you don’t know what I’m talking about, visit a bike friendly city and you’ll get it (you’ll also become overwhelmingly envious that you don’t live there). Even if you are the lone bike riding family, don’t despair. You have an opportunity to make an impact. There is something infectious about family cycling. 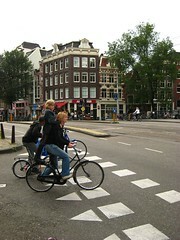 People are intrigued when they see families getting around on bikes. Kids ask their parents why they can’t do that too. Parents see you having fun and they may even notice how easy it looks. They may want to know more. Maybe you can convert a few people, just by riding around. Maybe you have school age children and you can start a bike to school program at your school. What can you share about your community? What’s the bike vibe around town? Do you feel welcome on the road when you ride? Is there anything that makes it especially easy (or hard) to ride with kids where you live (we, for example live half way up a pretty long hill. Anywhere we, or the kids, want to ride, probably means some hill climbing). Do you have obstacles you’d like feedback on? While Seattle is a “bike friendly” town, we sometimes still feel alienated as family cyclists. Our tribe is growing but we have a long way to go. How abut you? This entry was posted in bigger than here, bikes, family cycling, kids, neighborhoods, transitions and tagged bikes, community, Family Cycling, riding with kids, transitions. Bookmark the permalink.